These days, Symfony vs Laravel tops the chart as a PHP framework. Every-time, any PHP developer starts to build a website then the main question which comes in his mind that is which PHP framework should he choose. Though there are many PHP frameworks which are available in the market but, Symfony and Laravel are the top-rated PHP frameworks for website development. Both frameworks provide better and faster web development. The reason is quite simple as these frameworks provide you security assurance. With these PHP platforms, your application conforms the business rules to the fullest. Above all, these are structured, maintainable and upgradable. 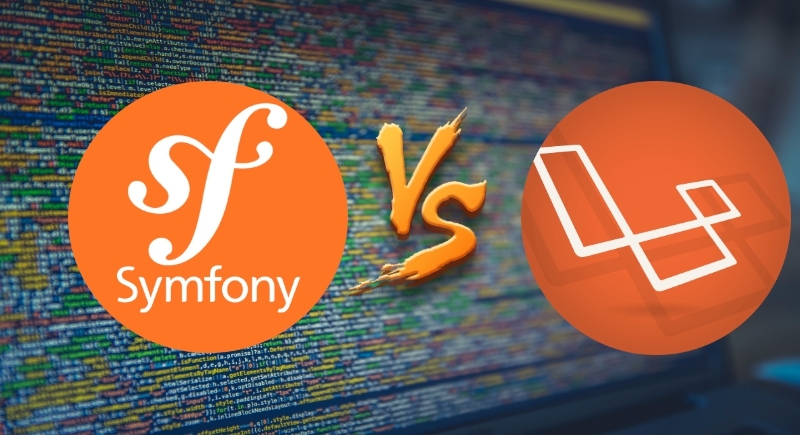 Are you planning to decide between Symfony vs Laravel? Although both are the best PHP web development frameworks. But, to select the perfect one is your choice. In this blog, we will compare the Symfony vs Laravel and mark the similarity and differences. Symfony and Laravel both have scaffolding features and full-text search. Both are the best PHP frameworks and support multilingual content. In both frameworks, you can use the cross-platform operating system with PHP programming language. Symfony and Laravel support multi-user system with autofocus and pingback. Extensions plugins are present in these frameworks that user can use to enhance website’s visibility. Image processing and revision control method, the one can use User Statistics. Both frameworks use machine code generation and object-relational mapping tool for PHP web development. Let’s have a look at some differences between Symfony vs Laravel which will help you choose the best PHP framework. Symphony is useful for handling complex and large projects in general. It supports highly extendable websites, which is an advantage while changing to the new business environments. A developer can use the Symfony framework with another open source platform such as Drupal and Piwik. Whereas, Laravel is useful for handling small projects as it provides a faster implementation. There is a built-in authentication system which simplifies the overall development process through an easy to configure option to migrate the database. Symfony framework can be faster framework if you use it properly. It provides an excellent performance speed and it is highly adaptable to user needs. This framework offers many scalability options which you can achieve by optimizing propels and limit the number of objects. Whereas Laravel development is extremely fast. It uses the autoloading facility, so, the user does not need to maintain it manually and does not require any inclusion paths for designing add-on function. Symfony uses Doctrine database in which migrations are done automatically for you. To access the data, you need to create a so-called repository function. While, Laravel uses the Eloquent database in which migrations are not done automatically, you have to make them manually. To access the data, you need some knowledge of SQL since most of the functions are based on SQL equivalents. Symfony uses the Twig template engine that has some advantages such as a bigger community, nicer looking code, and a variety of keywords. Whereas, Laravel uses Blade that provides reusability of code. Symfony provides support for YAML, PHP, and XML. Before using Symfony services, you need to register yourself in the Symfony account as it requires you to declare the service. Whereas Laravel supports PHP only and it has only manual support for factories and decorators. In Laravel, you don’t need to register any service. Symfony is not easy to use as it requires a good knowledge of object-oriented programming, which makes it less accessible to a larger number of developers. Those who have already used Symfony admit that as there are more options in Symfony to create a website but it is a little bit hard to deal. You can hire a dedicated PHP developer for using the Symfony framework. Alternatively, Laravel is easy to use as it does not contain any object-oriented programming concept. It is beneficial to handle small enterprises. Both Symfony and Laravel are the best options for completing PHP-based projects. However, Symfony is preferable for large or complex projects so, it is considered to be as the most stable PHP framework. On the other hand, Laravel is the best framework for full -stack development means it is very useful for front-end programming. Like Symfony, it also supports community support and LTS. Although both PHP framework are good, it’s your choice which you want to choose. If you are developing a large project and have professional PHP developer then you may go for Symfony framework. But, if you want extremely fast development then Laravel is the best option for you as it provides flexibility. PHP VS Java: Opt The Best One For Web Development!